CarGurus has 13,635 nationwide XC90 listings starting at $1,200. Say you’re an executive—maybe a newly promoted one—with the opportunity to be chauffeured around in an executive-level vehicle of your choice. Go the European route, and you’re looking at flagship German sedans like the Porsche Panamera or BMW 7 Series, if not a Bentley or a Rolls-Royce. Go the American way, and you’ll probably find your peers riding around in black Suburbans, Yukon Denalis, or Escalades. 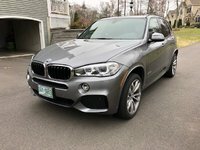 So let’s say you find you want a bigger, more generally capable vehicle than the Euro sedans, but not something as big or boxlike as the American options. Maybe you want something safer, maybe you want something a little different. If this is the case, 2016 might be your year, as it will see the arrival of the 2017 Volvo XC90 Excellence, the top-tier trim of Volvo’s flagship vehicle, on U.S. shores (having just debuted at the 2016 New York International Auto Show). The Volvo XC90 has been around since 2003. Its latest generation appeared in 2013, and the Excellence trim debuted at the 2015 Shanghai Auto Show, going on sale internationally for the 2016 model year. To those of us who grew up knowing Volvo primarily for its sterling safety reputation, the Excellence represented an unusual approach for the Swedish automaker (which is now owned by a Chinese multinational)—though perhaps not too surprising upon further consideration, with the ongoing proliferation of luxury SUV models that recently reached a new level of opulence with the Bentley Bentayga and Lamborghini Urus. Volvo might simply be dutifully following a trend in the global marketplace. Its new S90 sedan would seem to support such a notion. The 2017 XC90 Excellence starts where the T8 Inscription AWD (all-wheel drive), formerly the top XC90 trim in the U.S., leaves off. This includes a shared hybrid powertrain: both trims employ a 2.0-liter inline 4-cylinder engine that is both supercharged and turbocharged; the supercharger spools up the engine before the turbocharger takes over, providing more torque at lower speeds. In lower XC90 trims, the supercharged/turbocharged I4 provides 316 hp and 295 lb-ft of torque. The hybrid powertrain—which Volvo dubs the “Drive-E”—employs two electric motors, one mounted on the rear axle and another mounted on the crankshaft between the engine and gearbox. Both motors can deliver significant amounts of additional torque and are connected to a 9.2kWh battery located in the vehicle’s center tunnel. Altogether, the Drive-E system on the T8 Inscription and Excellence produces 400 hp and 472 lb-ft of torque, managed by an 8-speed automatic transmission. Two more things about the XC90 Excellence’s drivetrain. First, it gets good fuel economy for an SUV. Engine stop/start technology, regenerative braking, continuously variable valve timing, and other technologies contribute to an EPA rating of 20 mpg city/25 highway/22 combined. The powertrain’s hybrid function is rated at 53 MPGe. Second, AWD comes standard on the XC90, starting on all T6 trims and continuing up to the Excellence. Lower T5 trims—assuming they carry over pat from 2016—are offered with standard front-wheel drive (FWD) or optional AWD. The T8 Inscription’s interior was already impressive, far and away the most luxurious setup Volvo had offered to date. The Excellence simply adds the sorts of ultra-premium features you’d expect from a vehicle competitive with true European luxury cars (features that certainly place it head and shoulders above American exec-mobiles like the Yukon Denali). The most striking feature of the Excellence is its seating arrangement: as an SUV, the XC90 has been designed for 3 rows of seating, with a total capacity of 7 passengers. The XC90 Excellence, however, does away with the standard second and third rows and creates a new second row by duplicating the front seats and setting them a little farther back for additional legroom. The seats are covered in Nappa leather, surrounded by open-pore wood trim, massaging and ventilated, and host to a variety of comfort and entertainment features, including dual entertainment screens mounted on the back of the front headrests, a retractable control touchscreen near the armrest, and folding tables. There’s also a refrigerator with two handmade crystal glasses from Orrefors, the same Swedish design company that makes the crystal gearshift lever you’ll find up front. The rest of the cabin is commensurately luxurious. There’s a partition to keep the cargo area separate from the seating area (and help keep out any unwanted noise). A 20-speaker, 1,400-watt Bowers & Wilkins sound system delivers top-notch audio. And the central control touchscreen, comparable to the iPad-like screens in Teslas, dominates the dashboard: our reviewer who test-drove the 2016 XC90 praised Volvo’s infotainment system, Sensus, for its uncomplicated, intuitive use. Whoever’s driving will likely also be enamored of the head-up display. We mentioned Volvo’s excellent safety reputation above; be assured that it does not diminish with this new focus on luxury. 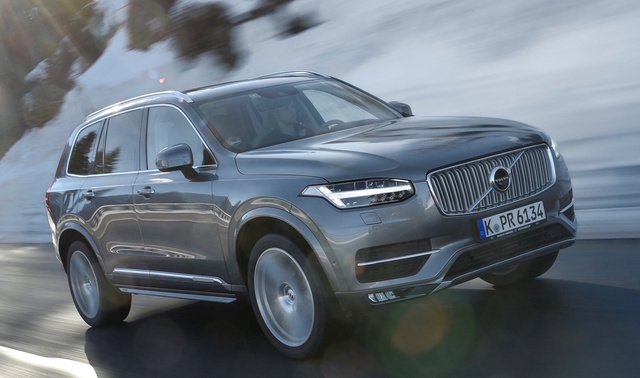 If anything, the XC90 is safer than other Volvos out there. It does not lack in standard safety features—antilock brakes with electronic brakeforce distribution, LED daytime running lights, a full suite of airbags, electronic stability control, etc.—or standard driver assistance features—collision avoidance with pedestrian and cyclist detection and avoidance, driver alert, lane-departure warnings, road-sign information, and roll stability control. Optional safety equipment comes aplenty as well, including a surround-view camera, adaptive cruise control with park assist, blind-spot information with cross-traffic alerts, and so on. Although the National Highway Traffic Safety Administration has not tested the XC90 since 2014, the Insurance Institute for Highway Safety named the 2016 XC90 a Top Safety Pick+. Something to keep in mind about the 2017 Volvo XC90 Excellence is its MSRP: $104,900. Good thing you’ve got that executive salary or expense account. What's your take on the 2017 Volvo XC90? Users ranked 2017 Volvo XC90 against other cars which they drove/owned. Each ranking was based on 9 categories. Here is the summary of top rankings. Have you driven a 2017 Volvo XC90? Volvo Engine Shut Off Didn't Start Back Up - Freaked Out?